These miniature satellite speakers are only 4 inches in diameter and will give you larger-than-life sound without the boxes. The new SAT3’s feature TruAudio acoustical standards with the most versatile mount designed for this type of speaker. This new mount attaches the speaker with a powerful magnet that allows you to point this speaker in almost any direction efficiently for better sound stage coverage. 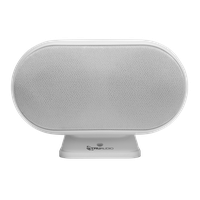 This compact size speaker produces amazing sound, with power handling unmatched in this class of speaker. 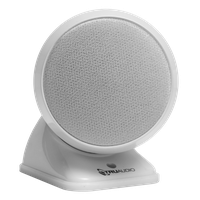 The SAT3 satellite has a high-efficiency driver for outstanding acoustic reproduction. 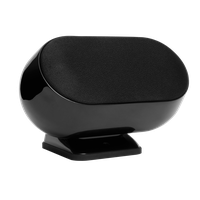 No other satellite speaker combines the versatility and ease of installation with such a high quality grade of components. 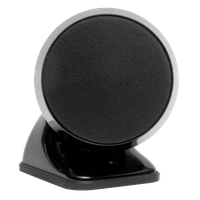 Premium round Satellite Speaker, 3" drivers, 13mm silk dome neo magnet tweeter, magnetic mount, 5-150 watts, 4Ω, black. Sold each. Premium round center channel Satellite Speaker, dual 3" drivers, 13mm silk dome neo magnet tweeter, magnetic mount, 5-175 watts, 4Ω, black. Sold each. Premium round center channel Satellite Speaker, dual 3" drivers, 13mm silk dome neo magnet tweeter, magnetic mount, 5-175 watts, 4Ω, white. Sold each. Premium round Satellite Speaker, 3" drivers, 13mm silk dome neo magnet tweeter, magnetic mount, 5-150 watts, 4Ω, white. Sold each.